When I was a kid this was one of the most exciting times of the year. There was my birthday, and the promise of book tokens, Dinky toys and a ten shilling note tucked into a birthday card, at the end of October. Then a week later, on November the fifth, it was Bonfire Night, or Guy Fawkes Night to give it its proper name. Wrapped up in warm clothes and wellies we’d go out into the garden after dark, light our bonfire and write our names in the air with our sparklers. 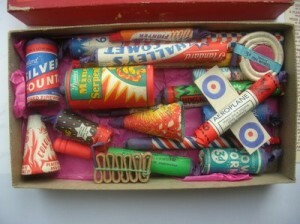 Dad would tell us all to stand well back as he lit the blue touch paper to the Catherine wheel pinned to a garden fence post which would either spin furiously sending out great showers of colourful sparks, or more often as not, sit there not budging, spluttering ominously until it finally burst into flames. 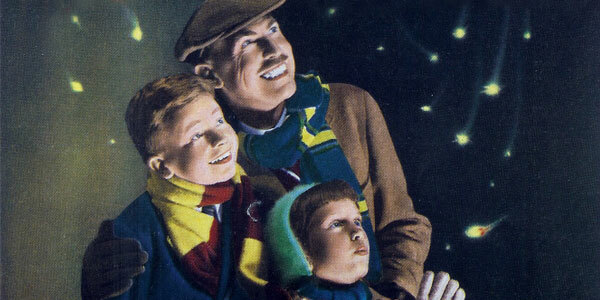 It was always a cold and damp night, but our mum kept our spirits up when the fireworks fizzled out with piping hot baked potatoes and mugs of hot chocolate. Nowadays people tend to go to public firework displays on Bonfire Night and watch from behind fences with the council’s Health and Safety teams lurking in the background. And there’s usually no bonfire, which in my opinion defeats the whole point of the proceedings. It’s not Guy Fawkes Night without a guy. We’re treated to a half hour of computerized pyrotechnics, with lots of really loud explosions; it’s all a bit like watching Walt Disneys’s take on the Blitz. But nobody seems to get particularly excited about fireworks anymore; we have fireworks for everything and anything these days. 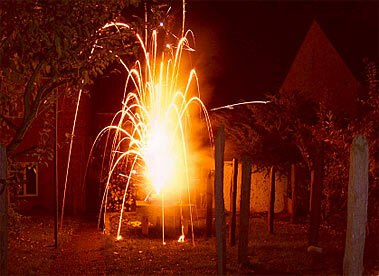 But back when I was a kid the only night of the year when we had fireworks was Bonfire Night. It would be anticipated for weeks, a bonfire in the back garden with a modest box of fireworks to let off would have us oohing and aaahing like nobody’s business. The month leading up to Bonfire Night was a time for collecting and stockpiling newspapers, cardboard boxes, bits of wood, old furniture – anything that would burn. It was usually stored in the shed or under cover at the bottom of the garden to keep it as dry as possible. Then we’d make a guy, an effigy of Guy Fawkes who although unsuccessful in blowing up the Houses of Parliament did, albeit unwittingly, give his name to an annual event that kids the length and breadth of the country looked forward to. We’d nag our parents for a discarded shirt and a pair of Dad’s old trousers which we’d stuff with newspapers, rags and the straw intended for the floor of the rabbit hutch, fashioning the whole thing into a guy to sit atop the bonfire. A ghoulish paper mache mask would be the piece de resistance, and could be bought from the sweetshop for a few pennies. Enterprising children would then borrow their baby sister’s pushchair and wheel their guy down to the local shopping parade in order to harass passersby for ‘a penny for the guy’ as a means of raising funds for fireworks. Sally from West Byfleet tells us that when she was a girl she lived in a small village in Surrey. Everyone in her village would collaborate in building a bonfire the size of a house on the village green. There would usually be several home-made guys sitting on top of the pyre. It was always exciting when the bottom of the fire was lit and the flames would start to lick upwards towards the hapless guys. One year a young lad decided to have some fun by dropping bangers and jumping jack crackers behind girls watching the firework display, to make them jump. Unfortunately, he was a bit careless and the next second he was jumping about himself, he’d set fire to the jumping jacks in his pocket. Sally’s dad rushed to the rescue, throwing the lad to the ground and smothering him with his motorcycle jacket before rolling him down a slope and into the village pond to cool off. We had something similar happen on one of the odd occasions we had a firework party in the back garden. We hardly ever had Bonfire Night in our garden because my dad worked nights, we sometimes got invited to neighbours’ houses, but this particular year Bonfire Night fell on a Saturday. Mama and Ba, my grandparents, came over, with my aunt Erica, my mum’s younger sister. We’d just got started with a Golden Fountain which was throwing out great showers of golden sparks, one of which landed in the uncovered box of fireworks. The next minute there was lots of loud hissing and then the whole lot went up all at once. The night wasn’t a total disaster though; we all had a turn at poking the bonfire and chucking on extra bits of wood at the first signs of it dying down which was just as much fun. On the eve of this year’s Bonfire Night I mentioned to my mate, Alfie, how having kids must make more of the occasion to which he replied, “Kids? Who needs kids? I’m just going to enjoy myself setting fire to things.” I must admit, I know what he meant, there’s a lot of pleasure to be had from a good bonfire. Sally says when she was a girl the food on Bonfire Night was always quite simple, it was jacket potatoes. She recalls sticking potatoes wrapped in foil at the bottom of the fire to bake. It was a fairly hit and miss method of cooking them, the end result was invariably a spud with as skin like charcoal and an only half-cooked inside. Even so, it was always exciting raking through the embers as the fire died down to discover a forgotten baked spud. Sarah from Leytonstone says she kept her kids fed on Bonfire Night with hot dogs, mugs of soup, hot chocolate and jacket potatoes with baked beans. As they got older, and more sophisticated, she would knock up chilli dogs and sauerkraut. Sarah was obviously a mum who felt that food maketh the occasion. In addition to the baked spuds and mugs of hot chocolate my mum also laid on sausages in bread rolls and sometimes a special toffee which we’d smash with a hammer before popping jagged chunks into our mouths. Click here for the toffee recipe, along with one for toffee apples and one for the perfect jacket potato.